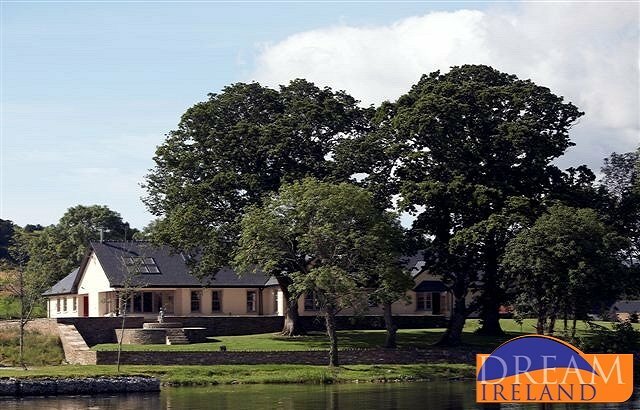 Bunglasha is cleverly hidden away off a scampering old roadway away from the outside world in a sheltered bay on the Southern Shores of Lough Derg. 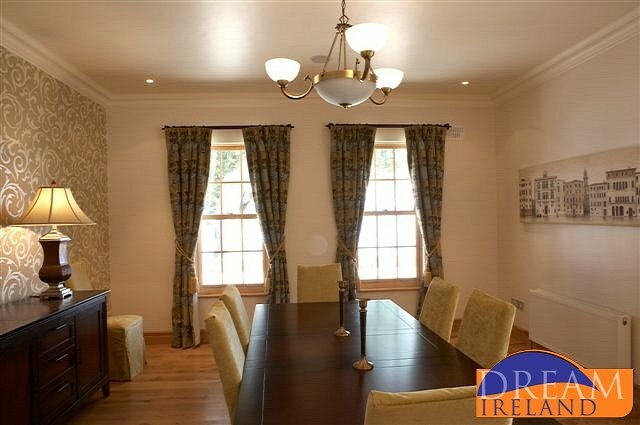 Bunglasha Lodge with some 200 metres of Lake Frontage and unobstructed views to Holy Island (Inis Cealtra, the Island of the eight churches) is the ideal private location for Family Reunions, Celebrations, Romantic Breakaways, Business Meetings or that Special Occasion. Imagine your private Hideaway which promises peace and tranquility and a blissful escape from the stresses of everyday life Relax in our beautiful Lakeshore Lodge overlooking the Lake and enjoy country walks, turf fires and Luxury Five Star Accommodation with modern kitchen facilities ideal for families, couples and for business. Bunglasha’s berthing pier is perfect for the discerning skipper who wishes to cruise or sail Lough Derg whilst enjoying the benefits of a private Hideaway Home. Bunglasha is available for hire, for pleasure, for business and for that special occasion. 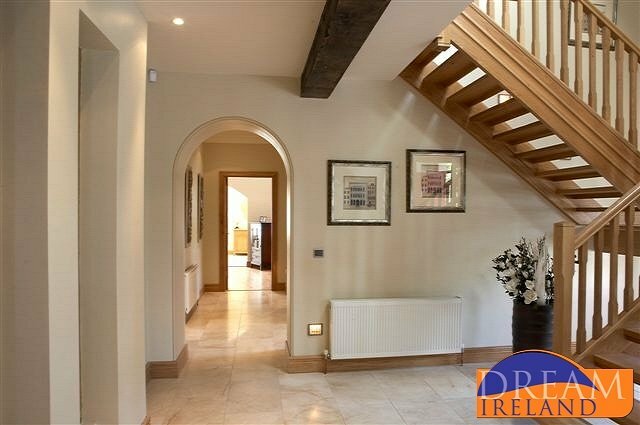 The entrance to the Lodge with paddocks and fine matured oak trees is through a cut solid Limestone porch which opens into a large entrance hall with vaulted timber ceilings and solid Oak Beams. The Decorative style is elegant with huge sofas, mood lighting and an imposing Open Brick Fireplace. The Fireside Bar which has Guinness and lager taps, is crafted from beautiful Elm timber. Rugs add warmth to the marble and oak wood flooring throughout. French doors lead from the Reception Room onto the stone paved terraces and Barbeque area for relaxed summertime dining. 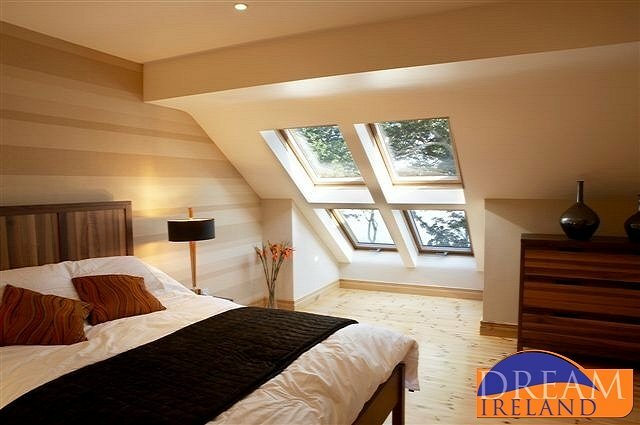 The unified colour schemes in the bedrooms create a cosy and intimate feel. 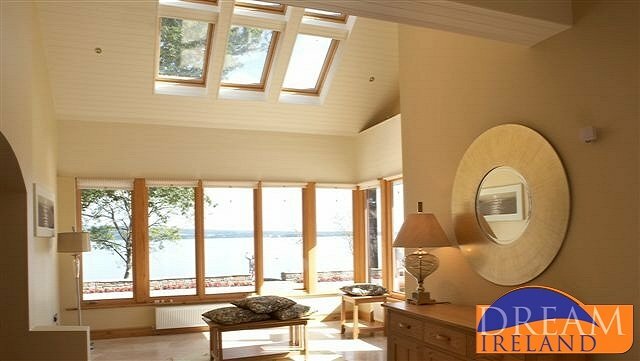 Three of our Bedrooms have wonderful views overlooking the Lake. Downstairs the main bedroom, complete with Jacuzzi, shower room, toilet facilities and walk-in wardrobe incorporates direct access to the stone paved patio overlooking the Lake. 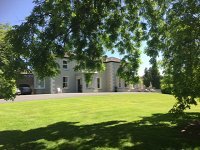 The house can accommodate 18 people comfortably but in certain circumstances larger parties of up to 24 people may be accommodated (please enquire with us at time of booking as extra charges would apply). • Taxi to and from your airport Destination and to visit our local attractions. • Your Fridge can be stocked with our signature WELCOME HAMPER, which consists of fresh fruit, selection of cheeses & cereals, savoury biscuits, Traditional Irish Brown Soda bread, Homemade Jams and Marmalade & local chocolates. • Cooked Breakfasts can also be prepared for you at the Lodge. • House Assistants can be arranged for you throughout your stay. • Local trips to neighbouring Islands and Villages are special. We can provide portable barbeque baskets or lakeshore picnic hampers for your ultimate enjoyment on your day on the lake. Our Scarriff River Boat Journey is a favourite. The deep water harbour and berthing facilities for a 20 foot cruiser make Bunglasha an ideal playground for your party to enjoy a daytime or evening cruise to local spots such as Mountshannon, Garrykennedy, Killaloe, Aughinish Bay and Holy Island (Inis Cealtra). Take our Taxi by Boat and explore the famous Scarriff river cruise – proclaimed by legendary Irish Broadcaster, Gay Byrne as “Heaven on Earth”. Harbours and Marinas dot the shoreline. You can experience the Irish traditional music festivals from Doonbeg to Miltown Malbay, Lisdoonvarna and Feakle. The following activities can either be arranged for you on site or enjoyed within the locality. We are experts in local knowledge and can put together tailor made packages to suit your individual requirements. Please contact us in relation to our all in packages for Golf, Shooting, Fishing and Horse Hunting. We at Bunglasha would be delighted to tailor a Sporting Package for you and fiends. 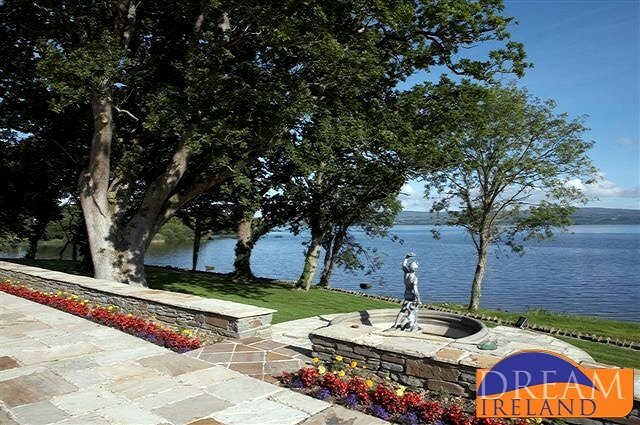 Bunglasha is 40 minutes drive from Shannon Airport and is situated approximately half way between Scarriff and Killaloe on the shores of Beautiful Lough Derg. "Thank you so much for your lovely comments in Bunglasha Lodge. It really is the prefect private place to get together with family and friends. 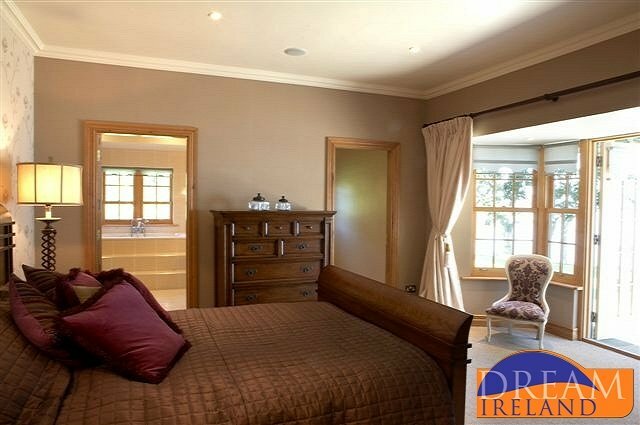 We hope to welcome you to another Dream Ireland location when you next come over this side of the Atlantic!" "Thank you for this wonderful feedback from your stay at Bunglasha. I was lucky enough to spend a Christmas in this gorgeous house with my extended family a couple of years and would have to agree with all your comments! Thanks for taking the time to contact us and we look forward to welcoming you back again."